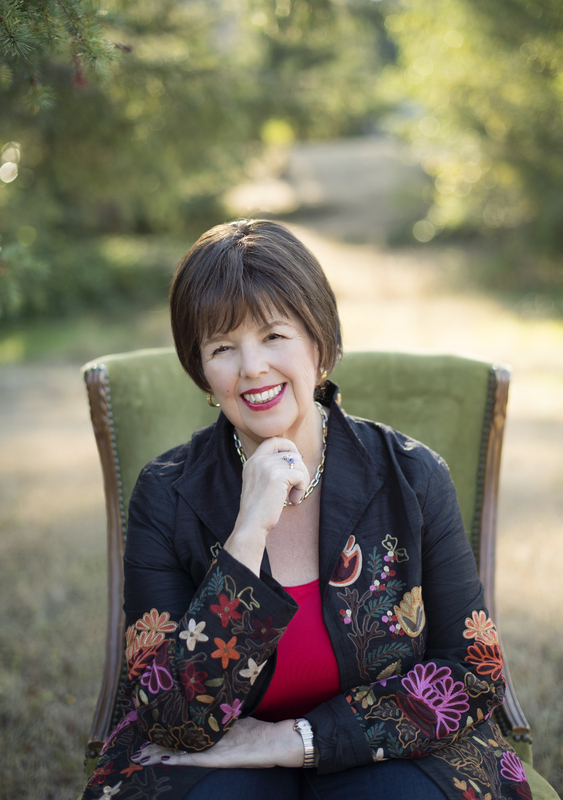 Beloved #1 New York Times bestselling author Debbie Macomber shares inspirational and empowering true stories of what happens when we commit intentional acts of generosity. Master storyteller Debbie Macomber knows a secret. In a world that seems too often reticent and begrudging, Debbie has learned firsthand that living in a spirit of generosity yields unforeseen miracles. Lives can be changed in ways we never envisioned. Just as a young boy volunteered his fishes and loaves to Jesus in Galilee and saw his meager gift multiplied many times over to feed five thousand, we can live open-handed and stand amazed at what God accomplishes through simple acts of generosity. This moving blend of true stories and motivating messages delights and surprises us as we see for ourselves that giving the gifts of time, encouragement, hope, laughter, prayer, hospitality, service, and forgiveness often have a life-changing impact, not only on the recipient of such gifts, but on the giver as well. All it takes is one simple act. Macomber, through her masterful power of storytelling, calls us to live with an open heart, offering who we are and what we have to God, to use in the lives of others. When we do so with an eager sense of expectancy, lives—including our own—are changed in ways we couldn’t have imagined. Kate stepped out of her bookstore at the end of a long, tiring day, locked the door behind her, pulled her scarf up over her nose and mouth to shield her lungs from the bitter cold air, and rushed across the lot to her car. Just one quick stop at the grocery store and she’d be on the way home to cuddle up with her new book in front of a warm fire. As she waited at the traffic light to turn into the grocery store lot, she took off one glove to feel if the air blasting out of the heat vents was starting to warm. Ah, yes. What a relief. In the few minutes it had taken her to get from her bookstore to the grocery store, her fingers had started to ache from the cold. “I think I was born with cold fingers,” she muttered. The light changed to green, and as she turned into the lot she came alongside a narrow median strip and noticed a man holding a crudely made hand-lettered cardboard sign: HOMELESS. NEED FOOD. PLEASE HELP. At his feet was a small white plastic bucket. His collar was pulled high against the cold, but her eyes went to his hands holding the sign. Bare hands. My fingers ache from five minutes in this cold car, with gloves on. How cold must his be? she wondered. Her eyes went to his face. Late twenties, probably six or seven years older than Mark. The sudden thought of her son instantly made her shoulders sag. She hadn’t seen Mark since summer. Addicted to drugs, Mark had left home several months ago after a two-year struggle—maybe war was a better word—with his parents over his drug abuse. He still called sometimes, but he’d been bunking with friends, house hopping, and he’d even slept on the streets rather than come back home. Never had she felt so helpless as she’d felt watching her son self-destruct during these past two years, never so powerless to meet the deep needs of the son she loved. But he wasn’t ready to give up his drugs or his illusion of freedom. He remained elusive about his whereabouts and declined every offer Kate made to meet him someplace to talk. Where is he tonight? Cold and hungry like this guy? Begging on some street corner? And if a kind stranger gives him a ten-dollar bill, he’ll buy his next hit of pills before buying a warm meal. Kate’s heart sank. Are Mark’s hands cold tonight? And then it came to her. A quiet nudge. She parked, hurried into the store to pick up bread, eggs, and some yogurt for the weekend, then hit one more aisle. Through the checkout, a dash back to her car, and back along the other side of the median strip, where she pulled alongside the young man, rolled down her window, and stopped. Her heart picked up its pace. He walked over to her car, bucket held out, but she didn’t hand any money out the window. Instead she held out a warm pair of gloves she’d just bought. He looked startled. “Your hands must be terribly cold,” she said. “I hope these help.” The young man looked confused for a moment, then accepted the gloves. “Thanks,” he said. The car behind her honked and she pulled away and moved toward the intersection. She glanced in the rearview mirror and saw him pulling on the gloves. She blinked to clear a few tears away. They were warm on her cold cheeks, but another warmth from somewhere in her core was spreading upward, and she found herself smiling. For the first time in a long time she didn’t feel powerless at the thought of Mark. Take care of my son tonight, Lord, she prayed. Show him Your love through the kindness of a stranger. And Lord, comfort the mother of that young man tonight. In that one simple act Kate had discovered the power of generosity. She’d not only warmed a troubled young man, she’d kindled a spark of hope for Mark. And she realized that God had just used her to care for the son of another worried mother. Who knows, maybe the young man on the median strip called his mother that night. You’ve read the subtitle of this book, Discovering the Power of Generosity. If you recognized my name on the cover of the book you may be asking yourself why a writer known for fiction is writing a nonfiction book on generosity. The answer is. . . well . . . if you don’t mind me quoting the title . . . simple. Have you ever discovered something so great that you just had to tell your friends? You know, like a great little vacation spot you stumbled across while on a trip, or a new clothing store with affordable prices, great selection, and really stellar service? Maybe you’ve heard a speaker who had a huge impact on you or saw a movie that made you laugh till you cried and you knew just the friend who needed it. When we find something we love, we want to share it with others and spread the joy. Right? That is how I feel about simple acts of generosity. I have had some encounters with generosity—as the recipient, the giver, the witness—that have had a profoundly life-changing impact on me. I’ve just got to share the news. On the other hand, you may have seen the word “generosity” and thought to yourself, Oh, great. One more appeal to go digging deep into my pocket. Don’t worry! You are not in for a brand-new load of guilt, I promise! That’s precisely what this book is not about. In our age of overwork and exhaustion, tossing a few dollars here and there may be the easiest way to practice generosity. But I am talking about it in larger terms—life-changing terms. Like my friend Kate. She made a five-minute investment of time and on a whim probably spent about eight or nine dollars on that pair of gloves. But her decision had nothing to do with her wallet. It had to do with her heart. When she handed those gloves out the window she brought unexpected goodness into a bleak situation. And that goodness spilled over and gave back. It multiplied. For my friend Kate, that was just the beginning. But that is a story for another time. When you pick up a book, it’s fair to ask, “What’s in it for me?” My goal in writing this is to surprise you with the multiple benefits that come from small and large acts of generosity. I’m convinced that we cannot become all we could be until we are willing to unclench our hands and release what we’ve been clinging to, what we’ve been determined to keep for ourselves. The intriguing part is that once we release such gifts we are free to take hold of something more, something better, something that God has wanted to give us for a very long time. Simply put, intentional acts of generosity can open our lives to the very best God has to offer. In fact, the very best that God has to offer is exactly where we need to start. Several years ago I read of the old Quaker tradition of keeping a gratitude journal. I was inspired by the idea, so I purchased a book with blank pages and titled it My Ode to Joy. Each morning I wrote a little thank-you note to God. I found it to be a way to start my day on a positive note. Little did I understand then how the discipline of writing down five things for which I am thankful every day would forever change my life. During World War II, Corrie and her sister Betsie had been arrested in Holland for trying to help Jews escape the Holocaust. They ended up in Ravensbrück, one of the most infamous Nazi concentration camps. Their barracks had been built to hold 400 prisoners, but by the time the sisters arrived at the camp, the one-room building held more than 1,400 women. Living conditions were insufferable. The women were housed like stacked cordwood on dirty, flea-infested straw that was strewn on wooden platforms. The fleas feasted night and day until everyone was covered in itchy, raised welts. If it hadn’t been for their Bible and the comfort the sisters were able to take from Betsie’s readings, Corrie didn’t know how they could have survived from day to day. If the guards had ventured into the room they would have discovered the forbidden Bible. Not only would it have been confiscated, but the consequences would have been brutal. Over and over, the two sisters wondered over the mystery of why the guards never inspected their barracks. One morning Betsie read the Bible verse in 1 Thessalonians 5:18 that said, “Give thanks in all circumstances.” She insisted that they put this into practice, feeling certain that giving thanks was the answer to their suffering. As Corrie tells the story, her sister named a litany of things they needed to thank God for—from the amazing circumstance that enabled the sisters to stay together, to the Bible she held in her hands, to the other women in the camp. But when Betsie began to thank God for the suffocating room and finally for the fleas, Corrie balked. It seemed impossible to Corrie to find anything for which to thank God in the deprivation of a concentration camp. But Betsie insisted, reminding Corrie that God said, “In all circumstances.” Corrie recalled standing in that room with all the other women, thanking God for the fleas and being certain that, for once, Betsie was wrong. Yet that prayer proved to be a turning point for the women. Their circumstances hadn’t changed, but their attitude did. Betsie and Corrie began to connect with the women in a way that changed those barracks and the women imprisoned there. It wasn’t until much later that Corrie discovered the reason the dreaded inspection never happened and their beloved Bible remained undiscovered. It was the very same reason she and Betsie were never stopped from having their much-anticipated Bible studies. The guards refused to set foot into those barracks because of the out-of-control flea infestation. When Betsie took God at His word and thanked Him in all circumstances, she had no idea those fleas were actually a gift from God. It’s easy to be grateful for the sunshine, the good things, plenty of food, meeting the budget, and compliant children. But God tells us to express gratitude in all circumstances. Think about it. That means we are called to offer thanks when the wind blows into our lives at hurricane force. We are asked to thank Him when the money runs out long before the end of the month and when the kids are pushing the boundaries and challenging us at every turn. It doesn’t make any logical sense, does it? Corrie ten Boom discovered the “sense” of giving thanks in all circumstances. She discovered the vital link between gratitude and trust. Through reading The Hiding Place and through the practice of keeping my own gratitude journal, I, too, have discovered this link. Though we may not understand the whys of our circumstances, by thanking God we grow to acknowledge that He is in control—that He can be trusted. We learn to release our iron-tight grip on our circumstances, and we experience a much-welcome reprieve from worry. The importance of giving thanks is made clear in Philippians 4:6: “Do not be anxious about anything, but in everything, by prayer and petition, with thanksgiving, present your requests to God.” Interesting, isn’t it? The antidote for anxiety is to pray with thanksgiving. The act of gratitude reminds us that God is worthy of our trust. I admit learning to praise God in all circumstances takes practice. I find I need to be intentional and deliberate in doing so and make it a day-by-day, even minute-by-minute exercise. My grandparents, Anna and Anton Adler, were immigrants of German-Russian extraction who settled in the Dakotas. They were dirt farmers during the Great Depression of the 1930s. My grandparents rose long before dawn, greeting each day with anticipation. My grandfather labored in his fields only to see his crops fail year after year. When all seemed lost, he didn’t give up. He looked toward the future. He heard of work picking fruit in the Yakima Valley in Washington State. Selling everything they had, my grandparents headed west with six children, leaving their two adult children behind, with their few remaining earthly possessions strapped to the back of their Model T Ford. They headed west, and without a backward glance, my grandfather left the farm behind. By all outward appearances he had failed just as the land had failed, and yet, as told in our family stories, my grandparents chose to thank God for the work ahead of them, rather than complain about what they had lost. In the footsteps of my grandparents I, too, want to look at life with a sense of gratitude. I see my journal writing as starting my morning out on the positive note of practicing gratitude. Instead of grumbling over the drizzle outside my kitchen window, I can smile and remember that it’s the rain that makes everything so green and lush in the Pacific Northwest. I once read that there are more verses in the Bible that praise God than anything else. I’m not a Bible scholar, so I can’t say for sure if that’s true or not, but I do know that when we have a thankful heart, despite our circumstances, we lighten our load. Nothing jump-starts our gratitude like practicing the habit of praise. King David, who poured out his gratitude in verse after verse of the book of Psalms, was called a man after God’s own heart. Isn’t that what we’d like to be? Simply reading his psalms of praise is an ideal way to build gratitude into our lives. A few months ago I was in line at the supermarket. My cart was piled high and I was anxious to be on my way. I was grateful that the young woman in front of me only had a partially filled cart. As I watched her carefully unload her groceries, I could see that she seemed anxious. As the checker finished ringing up the groceries, the young woman leaned across the check stand, whispered something to the checker, and left—without her groceries. The checker piled the bags onto the cart and set it off to the side. I guessed the scenario. The young woman didn’t have enough money to pay for her purchase. I looked at the mountain of groceries in my cart, remembering my own scary days back in the early 1980s when I first decided I wanted to be a writer. My husband, Wayne, and I had four young children, and as a construction electrician, Wayne was often between jobs. I remembered well when we were feeding our young family of six on Wayne’s unemployment check of $150 a week. I felt that inner discomfort that I sometimes get when God nudges me to do something. I call these moments “divine appointments.” It wasn’t by accident that I turned up behind this young woman. “How much were her groceries?” I asked. The clerk looked up as if she hadn’t understood my question. “How much was the bill?” I repeated. She pulled the tape from the bag and told me. Then she shrugged her shoulders as if she didn’t know why I’d be asking. “Kindly add that amount to my bill,” I told her. The clerk stopped checking my groceries. I was glad my piledhigh cart had kept others from lining up behind me. “Give the food to someone in need,” I suggested. I could see the clerk had never had someone offer to pay for someone else’s groceries. She appeared shocked and continued to stare at me. “Why are you doing this?” she asked. I explained that at one time I’d been in that young woman’s situation. I remembered wondering how I’d feed my family. I told her how grateful I was for all that God had given me. I tried to explain that with gratitude comes the urge to share. She didn’t say a word, and I was left wondering if I was babbling on far too long. What I was doing didn’t make a lot of sense. The clerk was right—the woman who’d left might very well not return. Yet I couldn’t shake the feeling that God wanted me to do this. I’ve come to recognize those promptings from God and learned not to resist them. Slowly the clerk returned to ringing up my groceries. “I want to know more about God,” she said simply. That’s when it hit me. This nudge from God wasn’t about the young woman who left her groceries behind. God hadn’t nudged me for her sake, but for the clerk’s sake! For whatever reason, she needed to witness an act of generosity done in the Lord’s name. Look at it this way: had God not been tutoring me in the habit of gratitude, I might have been stewing about the delay caused by the young woman’s inability to pay. Instead I was able to listen to that still, small voice that sometimes gently urges me to act. Had I rationalized that the young woman might never come back for her groceries, I might have missed blessing the person God intended. Although I frequently shopped at that store I never saw her again, and yet I feel God planted her in my path that day for His purposes. Keep the eyes of your heart open for those God may want to help through you today. Practicing an attitude of gratitude spills over to acts of generosity. My own discovery about the importance of gratitude was largely developed as I read the Bible. But did you know that science confirms the importance of gratitude as well? Two researchers, R. A. Emmons of the University of California, Davis, and M. E. McCullough of the University of Miami, have been researching the dimensions and perspectives of gratitude. Their findings fascinate me and have been the basis of dozens of articles in scientific journals and bulletins. Take a look with me at what they learned. Their experiments demonstrated that those who kept gratitude journals on a weekly basis exercised more regularly, reported fewer illness symptoms, felt better about their lives as a whole, and were more optimistic about the upcoming week compared to those who recorded troubles or neutral life events. As they continued to experiment, they found that participants who kept gratitude lists were more likely to have made progress over a two-month period toward their most important personal goals—academic, interpersonal, and health based—compared to the subjects in their control group.2 So gratitude not only contributed to better overall health but helped people reach important goals. Think about it. Our Creator designed us to benefit when we give thanks. And that’s not all. Here’s something else the researchers discovered: a daily gratitude exercise where young adults regularly focused on specific things for which they were thankful resulted in higher reported levels of the positive states of alertness, enthusiasm, determination, attentiveness, and energy. Remember that I said that generosity grows out of gratitude? The study also showed that participants in the daily gratitude experiment were more likely to report having helped someone with a personal problem or having offered emotional support to another. You see, when gratitude becomes a habit, then generosity seems to follow naturally. In a sample of adults with neuromuscular disease, a twenty-one-day gratitude intervention resulted in greater amounts of energy, positive moods, a greater sense of feeling connected to others, more optimistic ratings of one’s life, and better sleep duration and quality relative to a control group. 1. Gratitude defends. Just fifteen minutes a day focusing on the things you’re grateful for will significantly increase your body’s natural antibodies. 2. Gratitude sharpens. Naturally grateful people are more focused mentally and are measurably less vulnerable to clinical depression. 3. Gratitude calms. A grateful state of mind induces a physiological state called resonance that’s associated with healthier blood pressure and heart rate. 4. Gratitude strengthens. Caring for others is draining. But grateful caregivers are healthier and more capable than less grateful ones. our trust of God, but we benefit physically, emotionally, and spiritually. As we acknowledge all we have, as we learn to praise God for all He has done for us, God helps us pry our fingers off our possessions, our BlackBerrys, and our bank statements. This brings us full circle. Can you see why we explored gratitude before we set off on our journey to discover the power of generosity? Gratitude is the basis for giving. Grumpy, stingy people cannot live in the spirit of generosity. In order to be able to open our hands to give, we first have to give thanks for all we’ve been given. It’s just that simple! Begin a gratitude journal. Each day write five things for which you are grateful. Practice praise. Nothing opens our eyes to the gifts we have been given more than focusing on the Giver. Find at least one new thing to praise God for each day. Stay alert for those “God nudges” and be grateful when you sense them. When you feel like you should be doing something for someone, act on it. Keep track of those nudges. Write them down, noting how you responded and the outcome. When we practice listening for that still small voice we become better at hearing it. Thank God in all circumstances. This means that sometimes you’ll thank Him for the “fleas” in your life. 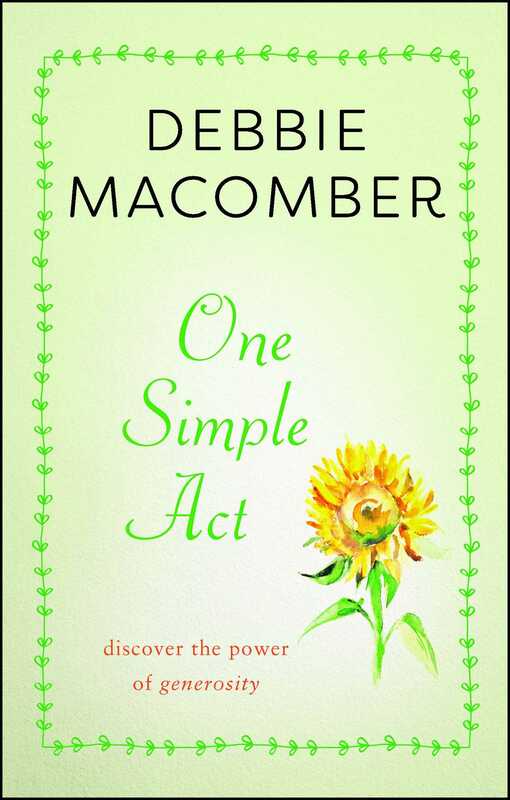 This reading group guide for One Simple Act includes an introduction, discussion questions, ideas for enhancing your book club, and a Q&A with author Debbie Macomber. The suggested questions are intended to help your reading group find new and interesting angles and topics for your discussion. We hope that these ideas will enrich your conversation and increase your enjoyment of the book. Can simple acts of generosity have a big impact? Absolutely, says bestselling novelist Debbie Macomber. In One Simple Act, she presents true-life tales that illustrate how the gifts of time, encouragement, hope, laughter, prayer, hospitality, service, and even forgiveness, often have extraordinary results—for the giver as well as the recipient. Just as a poor young boy gave his precious few fishes and loaves of bread to Jesus in Galilee and saw them multiplied to feed five thousand, so too can we use faith to guide us in acting generously. At the supermarket or the airport, making a simple phone call or offering a few words of encouragement, Macomber shows that it isn’t hard to make kindness part of our daily lives. Through a blend of inspiring stories and motivating messages, she proves that we all have the power to make the world a better place…one simple act at a time. 1. “My goal in writing this is to surprise you with the multiple benefits that come from small and large acts of generosity” (page 8), says Debbie Macomber. What did you find to be the most surprising thing in One Simple Act? Using examples from the book or from your own life, discuss how even small acts of generosity can make a difference. 2. Debbie suggests keeping journals on prayer, gratitude, and encouragement, or recording everything in one journal. Were you compelled to begin keeping a journal after reading One Simple Act? Why or why not? If you already keep one or more journals, how does this practice enhance your life? 3. Throughout the book Debbie shares anecdotes from her own life and from the lives of her family members, friends, fellow church-goers, and others, including a general who writes a letter to a young boy and a woman who buys a pair of gloves for a homeless man. Which story resonated with you the most, and why? 4. In what ways have you been inspired by One Simple Act? Share what you’ve already done and what you intend to do over the next year to “get in the habit of doing good deeds” (page 52). Debbie candidly admits that hectic schedules sometimes make it challenging to do this. Strategize ways you can accomplish your generosity goals. 5. Numerous scientific studies are cited in the book about the health benefits of being generous. In what ways are givers impacted by their actions, both physically and emotionally? How have you been impacted personally? 6. Discuss the list of “failures” on page 40. Why do you suppose Debbie decided to include this in the book? How do you view your own setbacks, knowing that people like Albert Einstein and Michael Jordan encountered stumbling blocks on their roads to success? 7. “There’s nothing simple or easy about forgiveness—it may be one of the costliest gifts we’re called upon to give” (page 57), says Debbie. Why is it important to forgive and to let go of bitterness and anger? Share whether or not there is someone in your own life you need to work on forgiving. 8. Discuss the two facets of prayer outlined on page 182: “praying that God works generosity and kindness into our lives” and “generously offering prayer on behalf of others, called intercession.” Why is prayer an important part of acting generously? 9. Look over the “Ten Rules for Happier Living” on page 214. Which of these things do you regularly practice? Which ones would you like to practice more? 10. Debbie has used her interest in knitting to benefit others by volunteering at a senior center and contributing to Warm Up America!, an organization that donates hand-made afghans to women’s shelters. What hobbies or skills can you use to help people, both as individuals and as a group? In the weeks leading up to your group’s discussion of One Simple Act, have members keep track of their acts of generosity and share them with the group. Along with One Simple Act, read a book that made a difference to Debbie Macomber—Corrie ten Boom’s The Hiding Place. Emulating a Macomber family holiday tradition, gather your book club members together to make homemade gifts for friends, teachers, mailmen, pastors, and others. For ideas, Debbie recommends the Gifts in a Bag series of books (www.cqproducts.com). One pages 136-137 of One Simple Act, Debbie shares some of her favorite passages of hope and consolation from the Bible. Take turns reading aloud your favorite Bible verses and discuss how they’ve inspired you. Q: From the personal stories you share in One Simple Act, it’s clear you have been practicing the art of generosity for many years. Why did you decide to write a book about it? Was there a particular moment or incident that inspired you to write it now? A: I was in the Newark Airport for an early morning flight to Seattle and stood in line for a cup of coffee, which I promptly spilled once I got to the gate. Someone in the Starbucks line saw what had happened and brought me another cup coffee. I remember how good I felt that someone would be so thoughtful, kind and generous to bring me coffee. On the flight home I kept thinking about generosity and the way it affects our lives. Q: Acting generously is something that is intertwined with your own religious beliefs. Why was it important for you to share your faith with readers? A: I can’t separate myself from my belief in Christ. I believe God called me to be His light in the secular fiction world. I pray about every book I write and ask God to guide me. My mission statement is to be a blessing and that’s what I long for my books to do; to bless my readers and gently guide them to a relationship with Jesus Christ. Q: The story of the boy who gives his loaves and fishes to Jesus in Galilee seems to have special meaning for you. How does the Biblical story illustrate the message of One Simple Act? A: I hope you’ll forgive me for answering by telling you about our puppy Bogie. He loves to play fetch but once I toss him a doggie toy, he refuses to give it up. I discovered if I show him a second toy, he releases the first. It’s the same lesson God uses with us. We have to be willing to let go of what we hold before He will gift us with more. In the story of the loaves and fishes, the young boy willingly gave up his lunch and in doing so, he enabled God to bless those 5,000 men plus women and children with a satisfying meal. Q: A surprising aspect of the book is the scientific data showing that generosity benefits the giver with amazing health benefits. Do you think knowing of this will encourage more people to act generously? A: That is certainly my hope. Q: One Simple Act is part autobiography, with you sharing details about your ancestors, your childhood, your family, and even your marriage. Is the book a way for readers to get to know the person behind the novels? A: That’s more of a by-product of the message I hoped to share. Q: You mention The Hiding Place author Corrie ten Boom and her sister, Betsie, numerous times in One Simple Act. Why did Corrie’s story strike such a chord with you? A: The Hiding Place was one of the first Christian books I read following my conversion. Her ability to thank God for the fleas is truly a testament that God is able to use all things for good. When I read how Corrie was able to forgive the man who had been so brutal to her and her sister, I realized that kind of forgiveness can only come through God—a lesson for each one of us. Q: You’re published well over 100 novels. Why might readers who enjoy your fiction also like One Simple Act? Why did you decide to turn to nonfiction? A: Basically I’m a story teller. One Simple Act is filled with stories—stories to illustrate the points, stories about me, stories that will touch their hearts. Stories are what remain in the readers mind. Even Jesus used parables to illustrate His points. I never intended to have a non-fiction career and yet I have felt strong Godly nudges that our Lord can use my success in the fiction world to lead others into the kingdom of God. Q: What did you find to be the biggest difference between the fiction writing process and that of nonfiction? What challenges did you face? A: It takes far longer for me to write non-fiction and so I had to come up with an entirely different way of working. Instead of typing, I record stories and have them transcribed. Then divide those stories into the chapter outlines and flesh them out with research. I find this much smoother process. My biggest challenge is meeting all my writing deadlines. Q: You mention in One Simple Act that you have received letters from readers experiencing tough times, and you make a point of offering them encouragement. When you began your writing career, did you envision that you would be able to use your affinity for storytelling to help and inspire others? A: When I first rented that typewriter and declared myself a writer, my primary goal was to write and sell a book. That seemed a big enough challenge. It was only after I sold that I paused and asked God to use me. Q: For people who aren’t affiliated with a church or who practice different religions, what would you like them to know about One Simple Act? A: It’s not about religion, it’s about a relationship with God. When we reach out in generosity, we are doing God’s work whether we recognize it or not. God loves us regardless of where we are in relation to him. Our kindnesses connect us to his heart and that’s a good start.